When two of the world’s most prestigious Italian brands combine their historic values, what results is a resounding expression of refinement, prestige, innovation, and pure emotion. Bulgari and Maserati have chosen to bring their ideals and their vision of excellence together to create a very special and memorable piece, the Octo Maserati. The collaborative design joins the knowledge in precision, performance, style and elegance that has always existed in each of the two brands. Bulgari and Maserati have both conducted significant contributions throughout their respective histories to shape and define the resemblance of ‘luxury’. The Octo Maserati is the quintessential expression of two luxury companies sharing their visions. This exclusive piece is available in a special series release and displays the Maserati Trident symbol on its transparent caseback. 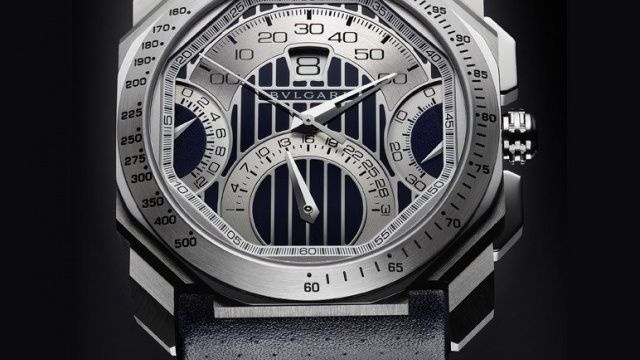 The dial consists of a vertical linear design that bears a resemblance to the Maserati's grille vents. The Octo Maserati, embodying harmony in design and perfect balance in proportion, is synonymous with passion of the kind that holds no compromise.